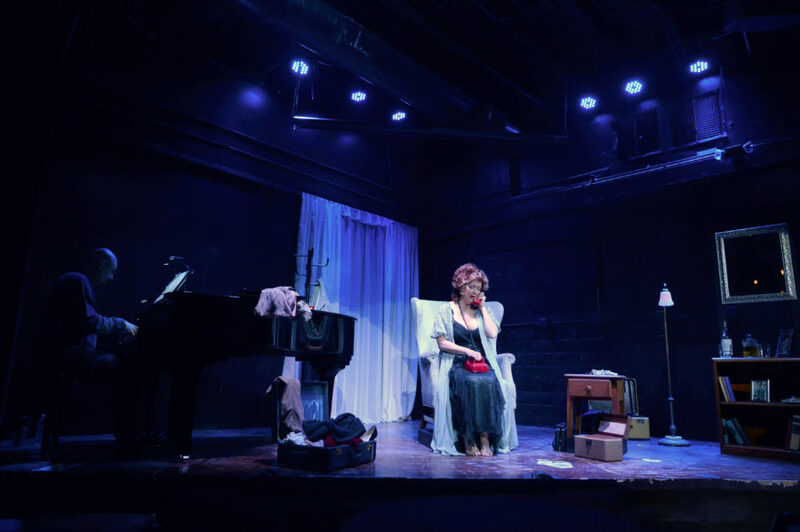 In recent years, Long Beach Opera has set some of its out-of-the-usual repertoire productions in out-of-the-usual venues. We’ve seen performances in swimming pools, parking garages, warehouses, and, just last month, the National Guard Armory. Now, if you hurry, you can enjoy Francis Poulenc’s “La Voix Humaine” in the intimate setting of an underground bank vault. Well, the cash has long since been counted and wheeled out, and the Underground Club, as it’s called these days, has been revamped into something of a black box theater beneath the Federal Bar, a former bank and now a spacious restaurant, on Pine Street in downtown Long Beach. “La Voix Humaine,” which is based on Jean Cocteau’s play of the same name, premiered at the Opéra-Comique in Paris in 1959. It is quite special, a rara avis, to be sung-spoken by a soprano (called simply “Elle,” or She), but the work is truly transcendent when performed by a skilled singer with perfect timing and great emotion. Suzan Hanson, who stands alone on the tiny corner stage, delivers a mesmerizing performance. The work runs about 50 minutes, which is about the length of one of Wagner’s arias, but Long Beach Opera has fleshed out the program with various songs and instrumentals. I’ll get to that in just a moment. The setting for “La Voix Humaine” (The Human Voice) is a disheveled room, presumably a walk-up off on a side street adjacent to one of Paris’s grand boulevards. Photos are scattered on the floor, a small bookcase sits to one side with a half-empty bottle of Scotch and two glasses, one partially filled and from which Elle occasionally sips. Nervously, she lights up one cigarette after another. An armchair with her lover’s clothes strewn over the back is front and center, an open suitcase is on the floor, and near the armchair is a small stand or table with a red telephone. Elle is in a state of deshabille, a white dressing gown thrown over a low-cut black dress. She is barefoot, she stumbles, and if she sang the way she looks she’d be slurring her speech. It is clear she is distraught. Something must have happened, or she senses will happen, between her and her lover, whom we never see and whose voice we never hear. 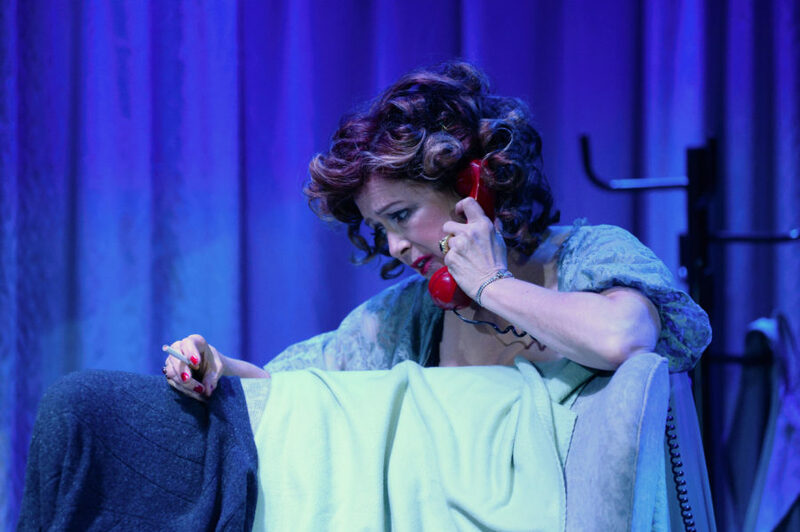 “La Voix” is a one-way telephone conversation, and it’s so intimate and painful that those sitting too close to the stage may find themselves slinking lower and lower into their chairs. The original libretto is in French, but Hanson sings it in English. Sure, English is not as elegant and as poetic a language as French, but the tradeoff is that we can focus on every word, every emotion, without looking up at supertitles, which would be an unconscionable distraction. Only purists (and snobs) will make too much of an issue of this point. The phone isn’t necessarily a girl’s best friend when the connection is poor and one shares a party line. Remember them? You’d pick up the receiver, ready to dial, and there’d be someone else on the line having their own conversation. As if Elle’s tête-à-tête isn’t anxiety-filled to begin with, these interruptions only increase her torment. “La Voix Humaine” was originally scored for a fairly large orchestra, but here there is just one accompanist, pianist Kristof Van Grysperre, whose playing echoes the travail in Hanson’s voice. The episode doesn’t end well (those little white pills that she empties from the bottle and sets on the piano have trouble written all over them), and no one will leave the building whistling a happy tune. But what a captivating experience, opera pared down, unplugged we might say, if opera weren’t already “unplugged” to begin with. Suzan Hanson has put her whole life into this role and it’s simply stunning. A few words, now, on the program’s first half. Instead of typical theater seating, audience members are assigned to one of the many cocktail tables that accommodate four just people. With the price of a ticket, a small meal comprised of sliders, salad, and potato chips is served before the performance. Two of the people at my table ordered coffee with their meals, and the other two ordered hard liquor. I won’t reveal which beverage I requested, although I’ll just mention that someone had to point me to the exit afterwards. Anyway, to continue: The first half is a divertissement, five quick pieces by Poulenc (the composer of “La Voix Humaine”) from his Dada- and Surrealist-inspired youth. Baritone Robin Buck narrates and sings, and he is accompanied by Van Grysperre on piano as well as, depending on the piece, violist Seulgee Park and cellist Christopher E. Brown. An additional few pieces by Erik Satie then follow. It’s about a 40 minute set, and it works as a prelude for the highlight of the evening… and for many of us, one of the operatic highlights of the year.